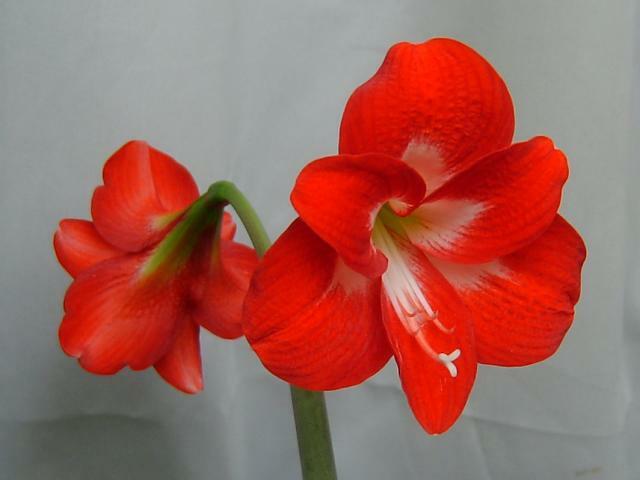 Pictures of Hippeastrum hybrids, often described as amaryllis and seen for sale in the northern hemisphere in December, are pictured on this page. Photos of plants with names from A-B are found on this page. 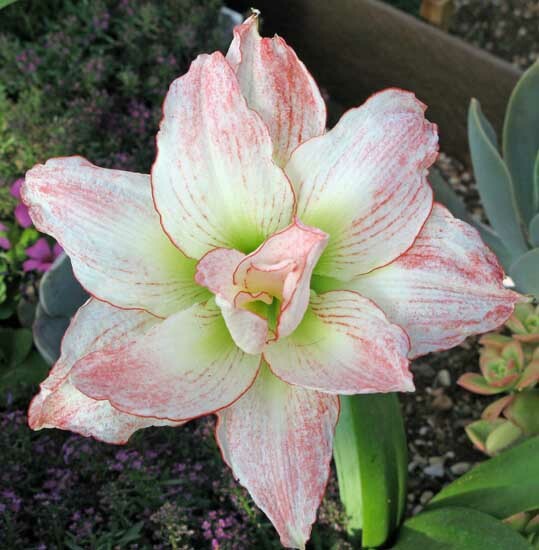 Hippeastrum × acramannii I got this plant from an UK nursery under this name and the label reported "an old cross between Hippeastrum aulicum and Hippeastrum psittacinum". The plant is rather odd, being totally summer dormant for me, pushing flower stalks in September with the leaves just following and growing all winter. 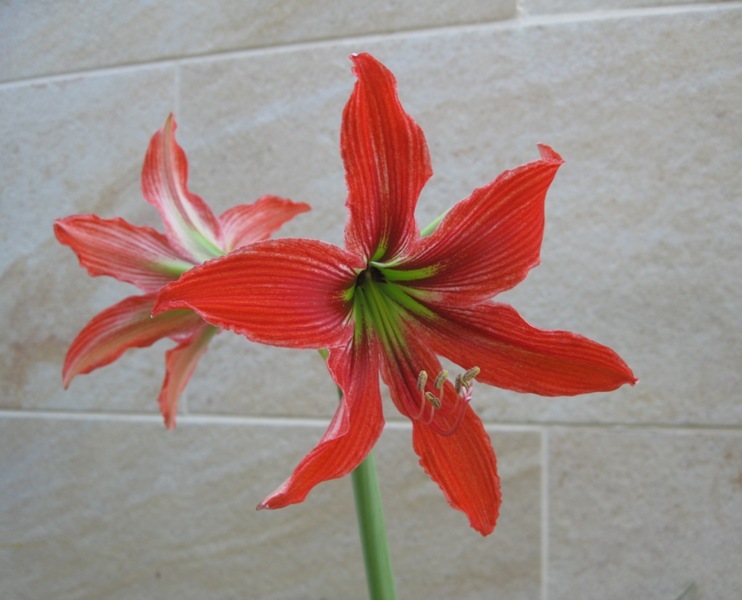 Another remarkable feature is the nice scent of the flowers, quite rare in any Hippeastrum. Flowers are born just two per stem and face upward. 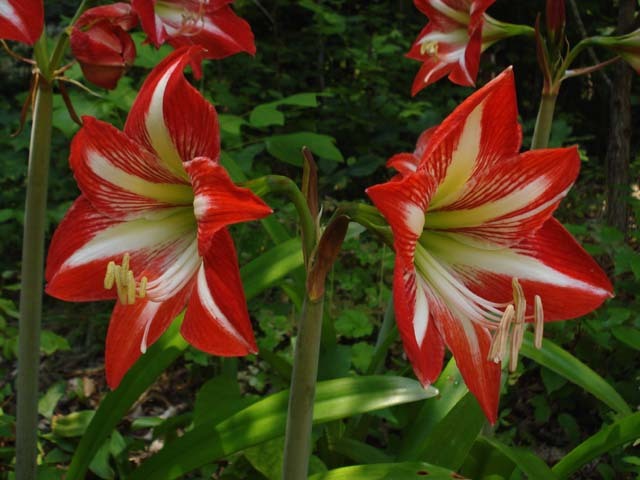 It is not clear if Hippeastrum × acramannii is the same plant as Hippeastrum × ackermannii; anyway this is a nice plant well worth growing. Photo and text by Angelo Porcelli. 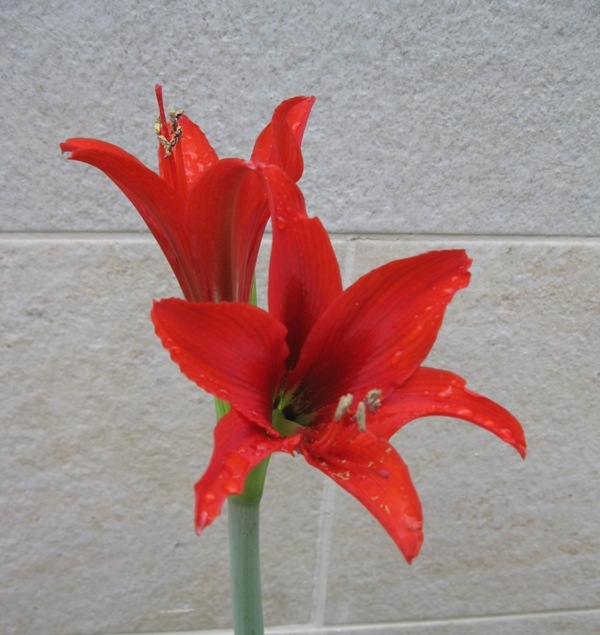 Hippeastrum 'Akadaruma' is mini cultivar from the Miyake nursery in Japan; the flower size is 9 cm. It is said that Mr. Miyake is Mr. Komoriya's young brother. Akadaruma means "red daruma"; the daruma is a hollow, round, Japanese traditional doll modelled after Bodhidharma, the founder of the Zen sect of Buddhism. Photograph by Mari Kitama. 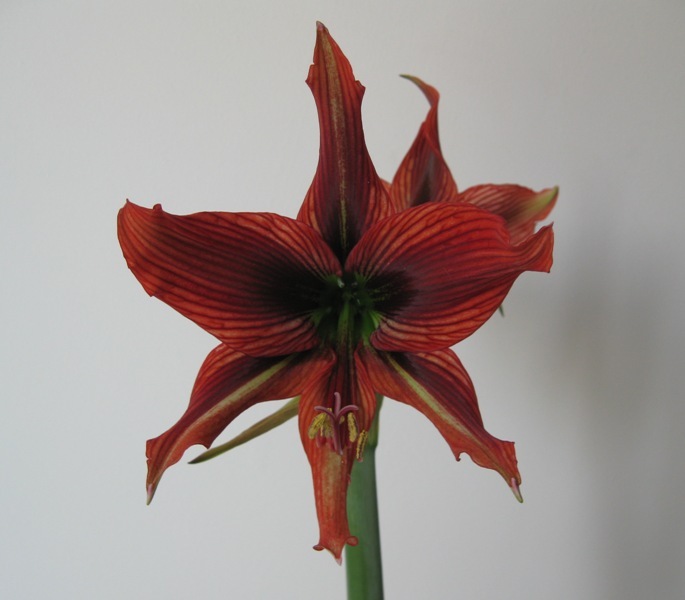 Hippeastrum 'Amputo' - photographed by Mari Kitama. 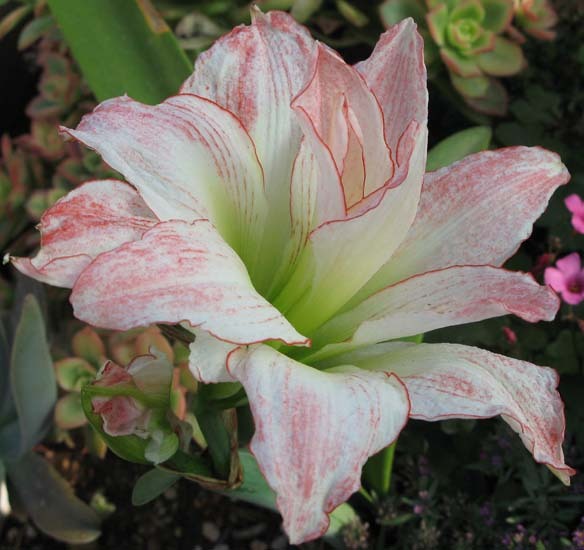 Hippeastrum 'Aphrodite' Photos by Pamela Slate for whom this always flowers in late April to early May in Arizona. 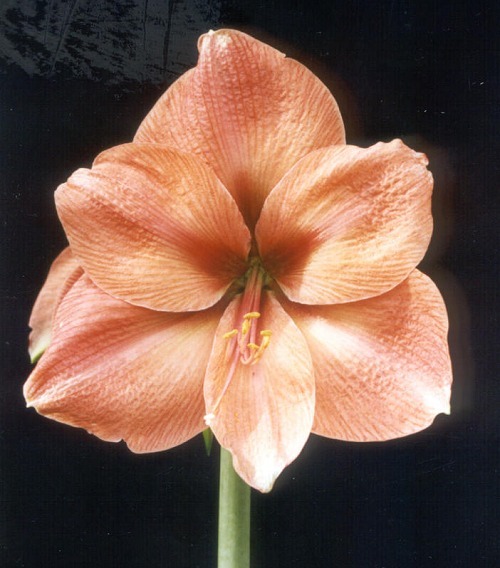 Hippeastrum 'Apricot Sensation' Photo by James Frelichowski. Hippeastrum aulicum × Hippeastrum papilio This is the first seedling of a batch of about 50 plants of this cross to reach flowering size. It flowered early June 2010. After some weeks the other two plants bloomed and were pretty much the same. It has a tall stem and plants are quite large. Photo and text by Angelo Porcelli. Hippeastrum aulicum × johnsonii I crossed these two species years ago and grew just a few seedlings, only one surviving. 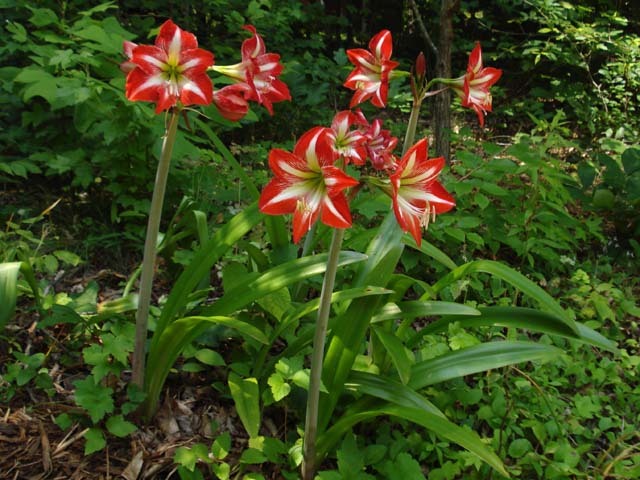 This plant has mediated the two flowering times of the parents (December for Hippeastrum aulicum and May for Hippeastrum × johnsonii) flowering at mid August. Also it has a summer rest like H. aulicum (in my Mediterranean climate) but it still stays evergreen, pushing new leaves after flowering. This cross is well known in literature as Hippeastrum × ackermannii (see former entry for H. × acramannii) but my result seems quite different. Photo and text by Angelo Porcelli. 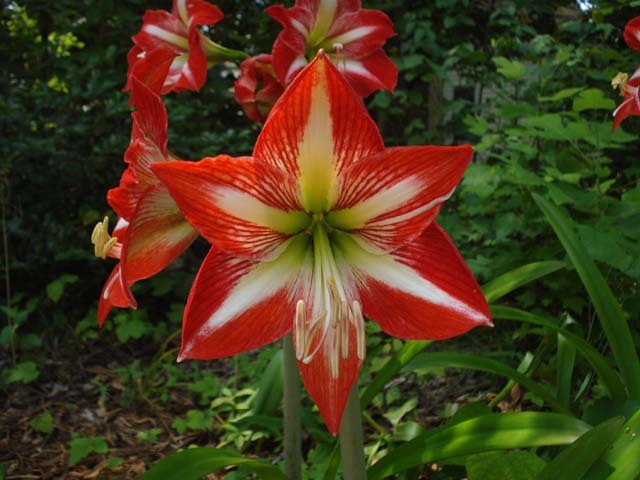 Hippeastrum 'Baby Star' has red flowers with a central white star. It's been one of the best performing hippeastrums in my garden, blooming reliably every season. Photos taken June 2007 by Jay Yourch. 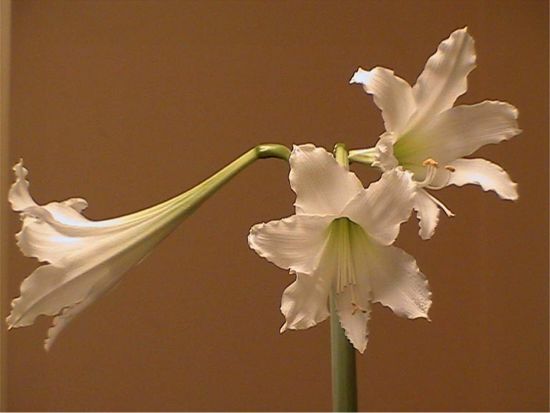 Hippeastrum 'Bianca' This does not follow the description given in Veronica M. Read's book Hippeastrum: The Gardener's Amaryllis, however that is how it came labeled. 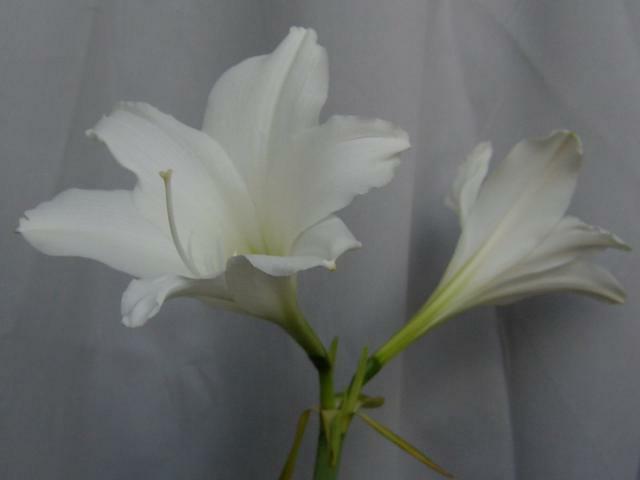 The blooms are 6.5" long, are a creamy ivory colour with a green throat and have a wonderful candy scent. Photo taken November 2005 by Linda Foulis.